How Do They Work and how can they protect your welding team and the workshop? The ArcSafe welding screen is manufactured from vinyl film, processed with a colour dye, a flame retardant and ultra violet absorber. The dye consumes and filters the blue light brightness associated with the electric arc welding process. The material surface acts as a reflector, causing the arc to appear larger and less bright, thus reducing glare to the eyes. The light is also scattered in different directions, creating a fluorescent light. This causes the pupil to constrict and shut out excess glare, thus reducing light to the retina. 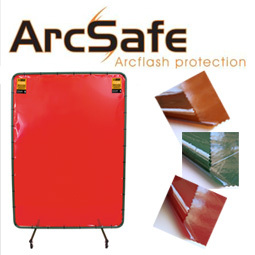 ArcSafe welding screens are available in three colours: Red, Green and Amber. The luminance Transmittance is the ratio of the luminance of a source of light when viewed through a curtain or screen, to the luminance of that source when viewed directly. Ensure your workshop protection is a certified product to provide the best protection for your workplace as well as your business. Elliotts ArcSafe welding screens ensure you are covered as they are the only welding screen certified to Australian Standards. Check your current welding screens and ensure you are protected. Product Certified: Elliotts ArcSafe Welding Screens are product certified to AS/NZS 3957:2006 Light transmitting screens and curtains for welding operations. Elliotts have an extensive range of products manufactured from high temperature resistant fabrics designed to protect workers, plant and equipment from the hazards associated with welding and fabrication processes. increase welding booth illumination without significantly reducing visibility through the screen. DuraWeld - combination of Arcsafe and NeoWeld materials offering a translucent top for viewing and Neoweld bottom for durability against spatter and dross.